Sky are reporting an estimated 90% turnout in Dundee. In East Lothian, they are reporting that at least 94% of postal votes have been returned - the authority's previous record was 65%. Elsewhere, the Dumfries count reports a 95.5% return rate on postal votes. And there may be some handed into polling stations. Haha, all you poor souls watching the telly and waiting. The result is already out on social media, a very healthy NO majority! I think this kills stone dead so many if not all issues regarding independence for Wales. Now it's time for WAG to show us it can run education and it can run the NHS in Wales. And run it just as well as it is run in England and Scotland. And if not, then the Welsh Assembly should be disbanded forthwith. No exit polls. According to the Guardian no major media org (BBC) wanted to pay out for them as they saw it as a certain No vote. Building a Wicker Man for Nick Robinson. YouGov president Peter Kellner has been telling Sky News about their final poll of 3,000 people: it shows a 54-46 lead for the No campaign. He said he was now "99% certain" of a "No" vote. The turnout in Aberdeenshire is thought to be more than 80%. One Yes Campaigner said in one part of Perth he counted turnout at 82% - it's usually 35%. He had tears in his eyes. Brilliant isn't it, some folk are talking about the turnout whilst others are discussing the result. Just so that there is no misunderstanding, the higher the turnout the greater the NO vote. All those hoping for a YES vote because of high turnout have been proven wrong. Better still, they have completely misread this referendum from start to finish. One wonders why so many of them even bothered to visit Scotland. Now, come on, let's all open another bottle of champers? Thanks for the comments. I still think a high turnout will favour Yes. For those who don't know, the BBC are running two parallel programmes. The British version is on BBC1 (and BBC News) but there is a Scottish version on BBC Parliament. What sort of mentality leads to two different versions from the BBC? I'm trying to keep an eye on both to decide which is better..
Scottish Conservative leader Ruth Davidson sounds a note of caution about polls, arguing that opinion pollsters might be the "losers" in the referendum campaign. "They haven't had a touch or a feel for Scotland," she tells the BBC. "They've tried to weight it to party politics and it just doesn't work." Just seen a flash that the turnout in Dundee is 78.8%. This is the first one to come in at less than 80%, which is perhaps significant as Dundee is a strong Yes area. Slightly concerning. But Yes in Glasgow are predicting a significant (54%) victory, which is fantastic for Yes. This is going to be a rollercoaster night. Clackmannanshire: 46.2% Yes, 53.8% No. Andy Marr on BBC just confirmed my point about high turnout benefitting the NO vote. Seems so many have read things so wrongly. Counting staff now re-entering building after the count suspended due to a fire alarm. Building evacuated for 10 minutes. So that's why the turnout was 10% lower. MI5 burning Yes votes! Orkney: 32.8% Yes, 53.8% No. Hooray, Shetland actually beat your target. Yes, it only needed 33%. Bear in mind that if, as predicted by others, Glasgow's Yes vote is 54% then everything changes because of Glasgow's size. Err its the Labour Welsh Government that needs to run education & NHS better in Wales, if not then we can vote them out. It's over now. No independent Scotland...the last Yougov poll was almost spot on so their weighting system was right. Most polls seem to have over estimated "Yes" by about 3%. United we stand. Who cares about anything else. It's been a long time since anyone was grateful for 'the majority'. Now it seems 'the majority' are going to asked what else they want. This may cause some problems in Wales and particularly in North Wales. I suspect rather more in England. Cameron now has to sell significant constitutional change to his party and "his" country, a gift to UKIP. Labour has seen a third of its core vote walk away in Scotland. Saved from more by Brown of the Dead? What does that say about Miliband and the English/Welsh heartlands? Be careful what you wish for. Is Wales observing a silence?! Wales is worried Scotland and England are going to force it out of the Union unless it bucks its ideas up. No-one wants to keep carrying a dead sheep around day after day. Shape up or ship out appears to be the message to Mr Carwyn Jones and his cohorts. The Welsh devolution project does now seem like collecting windfall apples after the storm. No great mass movement but when Scotland shakes the tree we shout "Us too" and "Over here". The danger with that approach is that it results in a very hollowed out settlement without real popular and civic roots. But then Welsh political and public life is now so moribund and the lair of the party apparatchik. How and where would a movement like Radical Independence emerge? Does anyone even care enough anymore. Has MH fled the country?! C'mon we all make vast errors with our predictions, its what the future's for. Remember, "a process not an event" - Ron of the Rovers. Nah, he's not fled the country. He's just upset that he managed to get it so wrong. As did so many others of his ilk and political persuasion. It matters not. The UK remains intact, greatly strengthened and in for a period of invigorating renewal. Nationalists need to look elsewhere for their fun. Try Belgium, France or Spain. Well there you go, no big surprises. 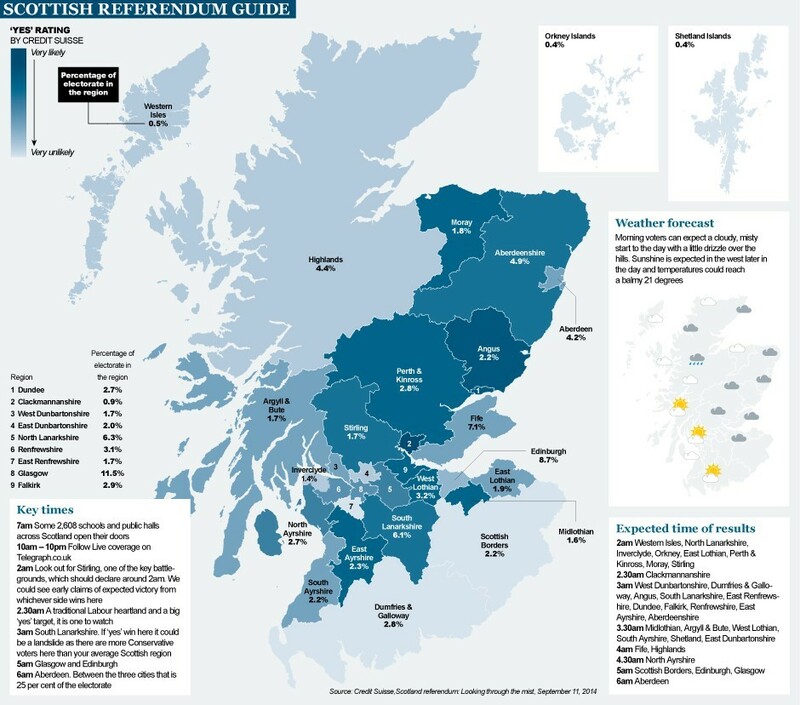 The silver lining of course is that with Glasgow and the Clydeside Labour heartlands voting for independence, the party is now completely screwed in Scotland. Amen. From now on the Labour and Unionist Party. That picture of Miliband clutching the Sun was no mistake. 'That picture of Miliband clutching the Sun was no mistake.' Have no fear, like Icarus, he will soon crash and burn. As for MH, he has a habit of making predictions based more on his own desired outcome than the actual evidence. But then again, who doesn't? hope youre well and not too disappointed with the result michael - lets face it there was no way the british state was going to allow scotland to go! the unionists threw every propaganda weapon at its disposal at the yes campaign - supporters of welsh independence should take heed that this is what they too can expect in the event of a independence referendum taking place in wales.